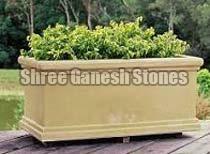 Located in Rajasthan, India, we are actively functioning as Manufacturer, Exporter and Supplier of Sandstone Planters. We make use of prevalent methodologies and techniques for their production. The Sandstone Planters, offered by us, are high on durability and do not break easily. Offered by us in different shapes and sizes, our Planters are easy to clean and are a wide choice for terraces, balconies, gardens and patios. The stains are easy to remove from our planters. Order retail or bulk, timely delivery is assured!